sawdust1 wrote: That is one stunning build and record of it! Thanks David, originally this was going to be a ghetto build but I got a bit carried away! I don't seem to have achieved much this weekend but I spent a fair bit of time on this. First off I shortened the Z axis torch mount to gain more clearance under the gantry. 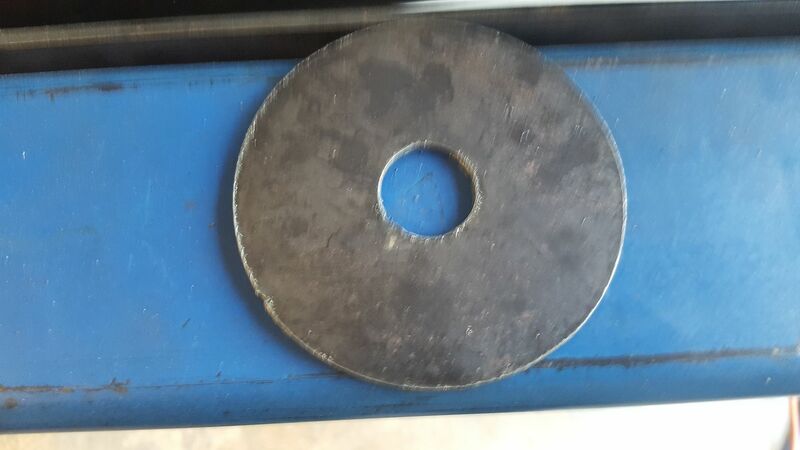 This was a bigger job then expected as my brand new bimetal blade had the teeth facing backwards so it did not cut very well at all. So I eneded up having to swap it out again for an old school blade. After cutting off the end, I had to drill a few holes so I could remount it. I'm using a 9 core shielded cable for the gantry limit switches. Allowing for +24v and - 24v signals, that gives me 7 signal wires and I need 6 to handle the limit switches and home switch for each side of the gantry. You can see the plasma torch lead and the three proximity sensor cables in this pic. 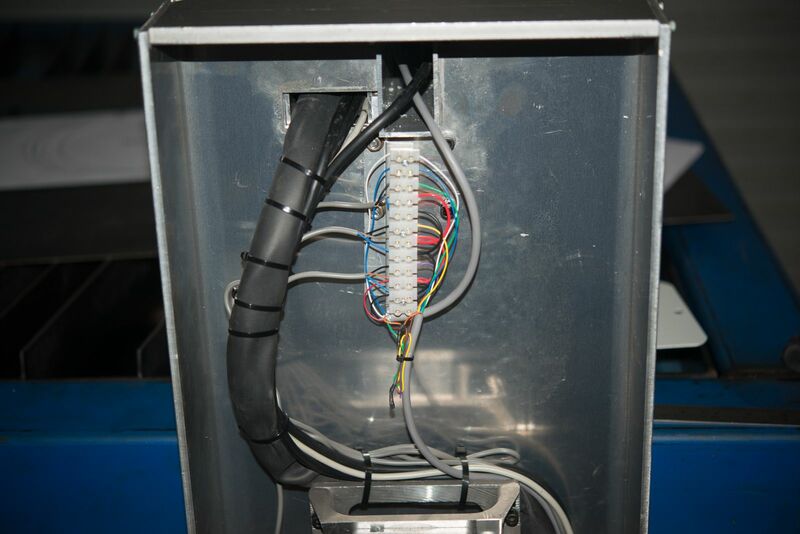 The remaining 4 signal wires are routed to the other side of the machine where the sensors are repeated. 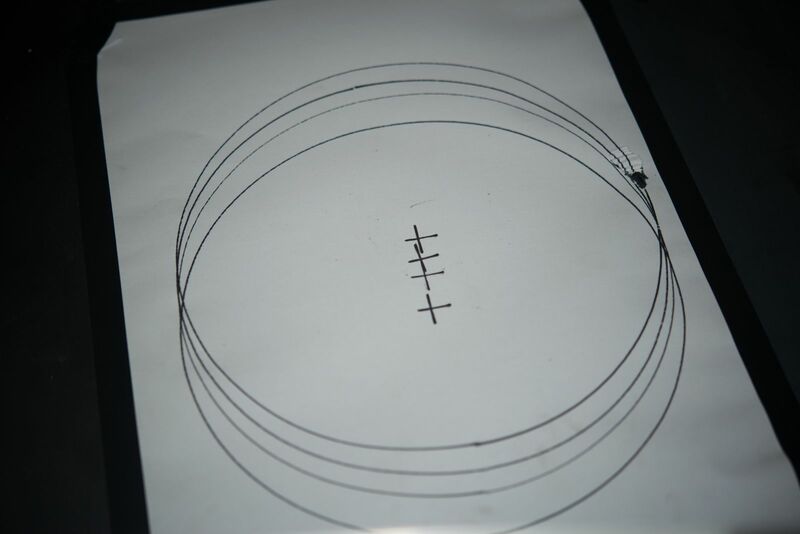 The pen ha s a bit of a wobble to it but it seems the dimensions of the circle are in the ball park. Anyway, thats as far sas I go today so I'm feeling pretty good about progress this weekend. Well it been 12 months since I bought my first part but this machine is nearly done. I'm really happy to actually see this machine running Gcode (at 18 metres per minute - 709 inches per minute). I've tested it without missed steps at 21 metres per minute (827 IPM) but I thought it might not be a bad idea to back off a bit. Now its moving, I've spent a fair bit of time debugging and double checking HAL and .INI files. I've done as much testing as I can without cutting stuff. But before I can do that I will have to make sure that I have a Sheetcam post processor that works. I did find out why people use Ohmic sensing. Here is some 2mm plate during a mock touch off and you can see the plate springing down before the probe triggers and follow the torch up. My Trafimet torch does not have provision for an ohmic sensor so I drilled and tapped the cup so I can attach a wire as there is now an electrical connection between the screw and the tip. 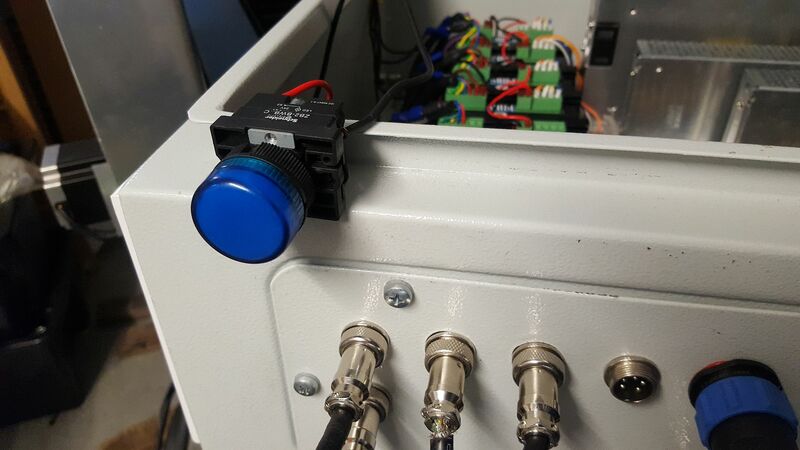 My torch has a connection to the earth clamp on the plasma in the CNC port and previously I found a relay circuit for a sensing circuit which I've modified a bit so there are a couple of safety interlocks. So I bought a couple of relays today so I can build this circuit. I am sure the questions will begin now I've got this far and here is the first one. I think the bottom two 24 volt lines that go to the workpiece and the torch should be from an isolated power supply so there is no chance of blowing up my Mesa 7i76e control card. What is the cheapest and/or best way to to do this? WIll a simple buck power supply off the 48 volt rail do the job or should I get a small DIN rail power supply? I am confused: So the external shield you tapped into is connected to the torch nozzle? have you used an ohmeter and touched the plate and gotten a complete circuit ? The 24V supply has to be completely isolated (cannot share its common -24 in your sketch) or you risk lighting up your control electronics. There may be some other issues. When the torch relay is relaxed (off) its supposed to turn off the sensing relay BUT the arc does not die instantly so your sense relay could come back on BEFORE the volts are below 24 and back feed your 24v power source. It won't work the way you have to drawn with a 100K resistor in series . There will not be enough current flow to turn on R3. Get the coil current rating and figure the drop across 100K. E = I X R. so lets say the relay is sensitive and only uses 10ma (.010A) then the drop across the 100K will be 60% of the voltage. If that is in the machine its designed to use with a solid state sense circuit that uses virtually no current. Tom, thanks for your input. There is continuity between the torch tip and the screw I added. Yes, the bottom 2 wires will be to a totally separate power supply so I don't light up the electronics. Sorry I did not draw it clearly. Thanks for flagging the voltage loss, I had wondered about that and if the relay would trigger but wasn't sure how to calculate it 40+ years after doing stuff with Ohms law. I measured the coil resistance at 637 ohms so that gives 0.0377 amps so I'll do a bit more work on this. Any further pointers would be appreciated. The Math is pretty easy. The current is the same in a series circuit . The voltage drop is proportional to the ratio of the Resistances So at 637 ohms if you were to put another 637 ohm resistor in series, the voltage would split 50/50 between them at 12 V each. As you can see you cannot have much if any resistance to get the full 24 volts. You won't be able to use a plate sense line driving a relay with series resistance. If you happen to unground your table the plate becomes positive. (workclamp is positive in relation to the electrode.) if the R2 relay contacts are ever closed with the torch on you can have hundreds of volts onto your power supply a high voltage blocking diode in the plate side lead would protect it from positive voltage flow. Relays are simple and pretty hardy but they take a lot of drive compared to an active circuit that needs micro amps. You have no protection for the R3 relay coil so what happens if you source it with 300Volts for 100msecs? Tom, thanks for the input. I think I've got a bit of a plan now. I found a few Solid State relays in a junk box that trigger with 12 volts and can switch up to 50 volts, 0.01 to 2 amps. They have opto isolation up to 250 volts and only need 20 mA max to trigger. So if I use a 12 volt power supply instead of 24 volts to trigger R3, the 100k built in resistor should be a perfect match as a current limiting resistor for the SSR at around 10 mA. So as long as the Mesa 7i76e input sinks 10 mA or more, which is the minimum quoted for the relay, I'll be in business! I've swapped a few notes on another forum with John who is on a similar journey to me. Instead of my SSR, he's used an opto22 module (which are a bit hard and expensive to find in Australia). He also used a couple of IN4007 (1000 volt) diodes to protect against back current much the same as I had planned to do. He's tested his circuit on a Hypertherm 45 so I can't see why this won't work. One thing I noted was the opto22 module is quite slow switching at 3 ms and my SSR does it in 1 ms which is more in line with the LCNC servo thread. I'll rig it up on a test bench before hooking the plasma up to my table and go from there. Better run those numbers again . 10ma across 100,000 ohms drops ALL of the voltage. I'll bet he does not have the 100K resistance in series with the plate. The model resistance of the SSR is 12//01 or 1200 ohms. A 100K in series with 1200 drops 98.8% of the voltage across the 10oK and 1.2 arcoss the SSR input. tcaudle wrote: Better run those numbers again . 10ma across 100,000 ohms drops ALL of the voltage. I'll bet he does not have the 100K resistance in series with the plate. The model resistance of the SSR is 12//01 or 1200 ohms. A 100K in series with 1200 drops 98.8% of the voltage across the 10oK and 1.2 arcoss the SSR input. Now I know why I never took up electronics as a hobby. Its the maths that stuffs me up! Whats a factor of 100 between friends? The relay needs 1k current limit, not the 100k in the plasma machine. Its becoming clear to me that the signal in the CNC port hasn't been designed with ohmic sensing in mind. I think the easiest solution is to bypass it totally and run my own wire to the work piece. Thanks again Tom. Well, I've bitten the bullet after all of the advice here and on the LinuxCNC forum and mounted up my SSR with a sprinkling of 1N4007 (1000 volt) diodes and a current limiting resistor. 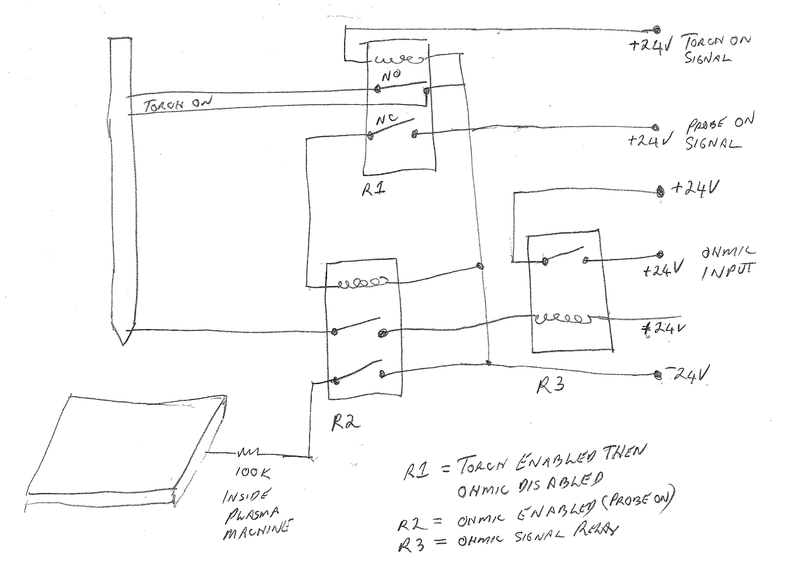 This will take the place of R3 in the diagram but be wired directly through the table instead of attempting to use the built in relay. The diode tucked away on the left is attached to a couple of spare terminals so I put it in front of R2 closer to the torch and plate. I think I might need a second one up there too. By the time I get this done, I'll have about 4 layers of protection so I think it should be OK. A lot of things would have to go wrong before there is any risk of frying something. 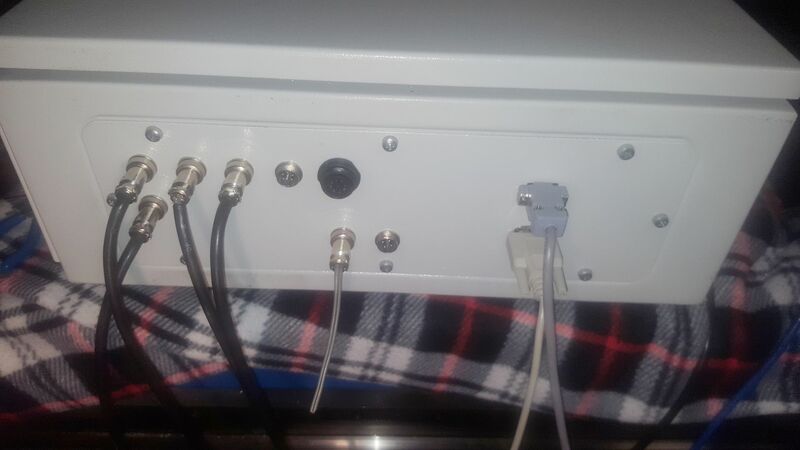 And an SMA coax connector for the wireless pendant closer to the top of the enclosure. I had one stuffup that cost me hours trying to work out why the gantry was not homing correctly. 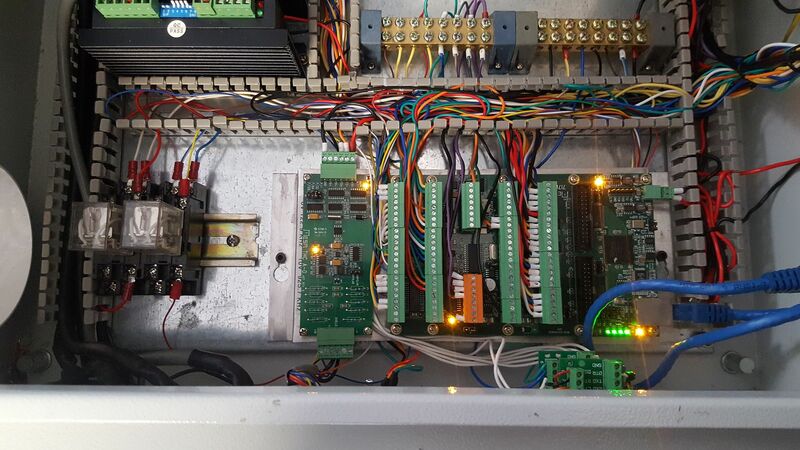 Eventually today I worked out that I had accidently plugged the 5V stepper controller wiring back into the wrong controllers so stepgen 0 n the 7i76e was wired up to joint 1. This was OK except that the home and limit switches were unaffected. so when we homed, the wrong switch was triggered so the wrong motor kept running. That will be all double dutch to anybody that is not using the new LinuxCNC joint axis homing sequence for gantries. What happens when homing is that the gantry heads towards the homing switches and when the first side hits the homing switch, it waits for the other side to catch up. Once it catches up, each side moves to the specified offset and then home is set. The good part about this is that you can home the gantry in software by altering the offsets. 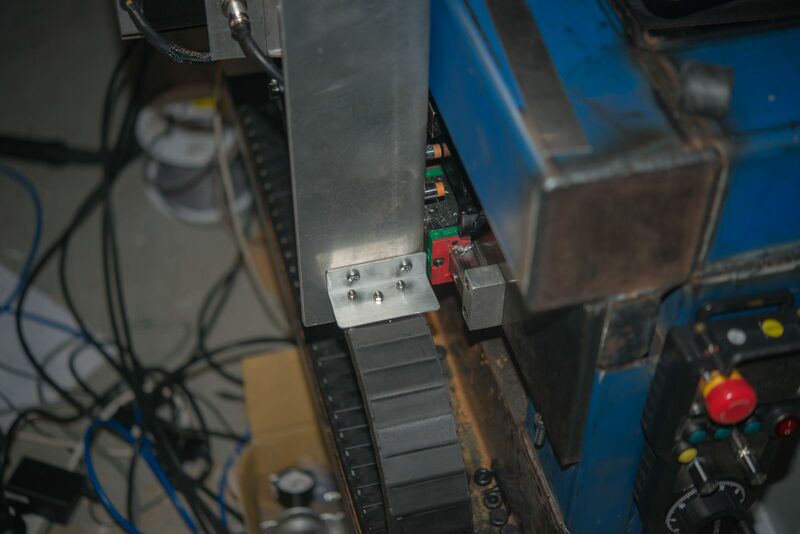 In my case, the offsets were different by 2mm between sides to square the gantry. The problem I had was the wrong side was trying to catchup which did not work very well... I only worked it out after I really slowed down the homing velocities so I could see what was going on. Anyway, If I can massage a Sheetcam post processor, I might even be able to cut something this weekend! But don't hold your breath as I've got a busy few days coming up! I also have a couple more wires to add to the cabinet for the 5th axis and a couple more things so I can seal the cabinet up once and for all. None of these are critical for the present config though. We had a lot of trouble this morning. I've had the machine torch for 12 months but this was the first time I had plugged it into the machine. The torch came on with the machine and would not go out. 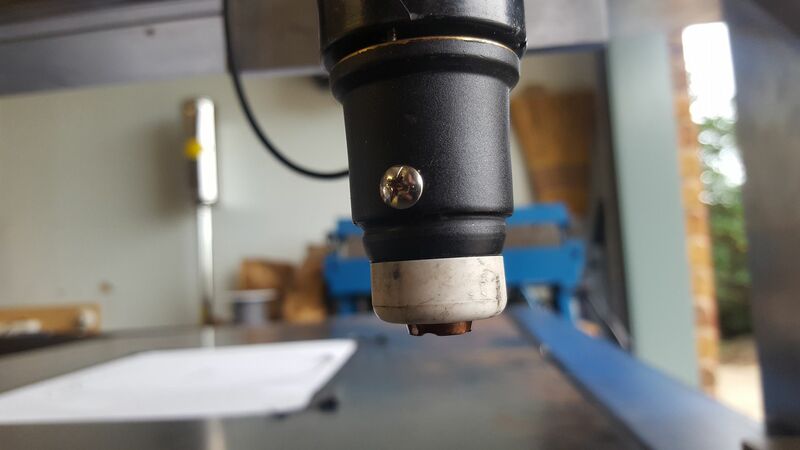 Then we tested the hand torch and we could control it from LinuxCNC without having the trigger pressed. So after comparing wiring between the two torches, I cut one wire inside the machine torch so it looked like there was a switch turned off and everything worked perfectly.Well it sounds simple but the process took sevearl hours of troubleshooting! I've still got some things to sort out. I was not seeing an ArcOK signal or a torch voltage from the Mesa THCAD. I hope it is just a wiring fault in the cable I made up. I'm also not sure about the flameout on startup. We manually edited some Gcode and did get the outer circle to cut completely so I'm not convinced its not a programming fault. We also tweaked the kerf width and the end result is a perfect circle that is the same size as the original laser cut one so I'm happy. I have so much work to do to set up Sheetcam and work out the right cutting speeds. That is an odd problem with the torch doing the pierce and then off for a short time then back on. I would look at the trigger circuit, try putting a meter on trigger contact wires and run the same cut G-code without the plasma on. It should show a short from pierce to the end of the cut then open. The torch may have a switch to make sure the consumables are tight since you state it worked fine with the hand held there may be a wiring problem with the machine torch. Thanks, we only triggered the hand torch by toggling the relay on and off as the machine is not set up to hold a hand torch. The same code has previously been run with a light attached to the torch relay and it seemed to operate correctly. Its clearly related to time, not distance travelled as when we increased the travel speed, the gap became larger so it its nothing to do with any gcode. I don't think its a torch wiring issue as all we've done is exactly replicate the hand held torch wiring after disassembly and a lot of prodding of both torches with a multimeter. I was also going to earth the table as it isn't earthed yet and try adding a capacitor across the relay which I've seen as being a solution on this forum. Would a solid state relay be a better choice than a mechanical one? I don't believe a SSR will not work as you are opening and closing a circuit not an AC voltage. You don't show you equipment that may help others to point you in the right direction. Thanks, I found that thread last night and was going to grab a few different sized capacitors today. I'm running LinuxCNC with a Mesa 7i76e ethernet card and a Mesa THCAD Voltage to frequency converter to read torch voltage. 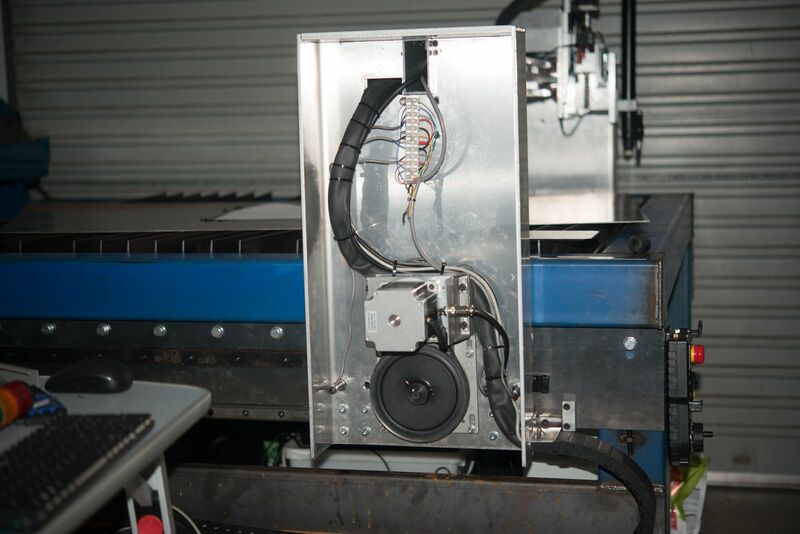 The plasma cutter is a Everlast PowerPlasma 50 with a Trafimet S75 Blow back style Machine torch purchased from Everlast Australia. THe plasma has a CNC port. Control voltage is 24 volts. The panel relays on the left are for ArcOK and Torch on. The small card with the connector each end is the THCAD and the 7i76e is on the right mounted right beside the THCAD. I've isolated 2 faults this morning. 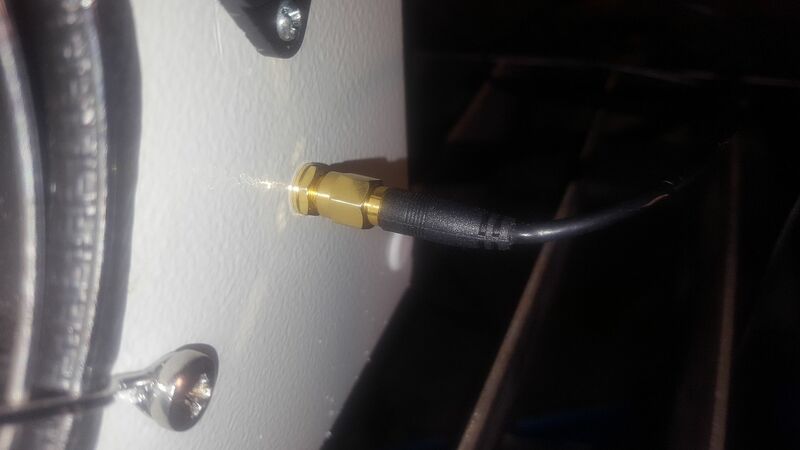 The THCAD top connector (the CNC side) was not properly seated so there was no power to it which explains why there was no voltage back in LinuxCNC. One of the ArcOK signals was wired to the wrong pin in the interconnect cable at the plasma end. The wrong pin used is not connected at the plasma end. YOu've no idea how many times I've missed that fault when checking wiring as I went! So that will just leave this flame out to solve. I guess its possible the plasma is waiting for a return signal from the ArcOK (which is missing) but I'm not holding my breath. This light should come on when the torch is enabled. If it goes out when its not cutting, it is a fault in my electronics side. If it stays on, its a plasma problem. I also measured the voltage on the plasma torch on pins with the plasma on. Its around 2.38 volts. I was a bit worried there might be a voltage loss across the 5 metre long cable I made up but its no different at each end of the cable. The voltage seems quite low to be controlling a plasma cutter! I was piercing too high and the machine was cycling again to establish an arc. But we had already started to move before the restart happened so we got the gap seen in the video. SO I dropped the pierce height to 3.0 mm and it seems perfect now. At least now I know I don't have to worry about trying to pierce again if an arc is not established, the machine does it for me! Still so much to learn. I'm sure it was hard to get that smile off you face when you made that cut, Congrats on winning the battle with the bugs. It has been a long trip but now the real fun begins, production from a table that you built. If you have not done it already there are many great files to download from here to cut. Thanks Tom. Yes I did have a grin from ear to ear 12 months after I purchased the first part. There is still a lot of work to do before I can say its ready for production cutting. I need to finish the table, getting some sort of downdraft for fume control and mounting the control cabinet and air regs and filters etc. This has truly been a DIY project. From what I can see, most DIY tables start with some sort of kit or use prebuilt Z axes and torch breakaways or an electronics kit whereas I've built every part myself. Not to mention many hours working on the software and screen interface. The real fun will be the Torch height control which is based on a new experimental branch of LinuxCNC as I don't think anybody has actually used it on a real machine yet! I did turn it on for one run and the torch did not crash into the material so that was a start. I know where you have been after building 7 tables from scratch only kit was 2 DTHC from Tom C.
Gave me a chance to try different things (plasma units, THC, and different software). Learning a new CAM program to do some router work never stop learning. I suspect the pierce delay might be a bit too long but I don't know anything about this to establish a base line that I can compare to. I started with cuts at 100 mm/min apart, zeroed in on the best looking one and then repeated (several times) at 10 mm/min apart. 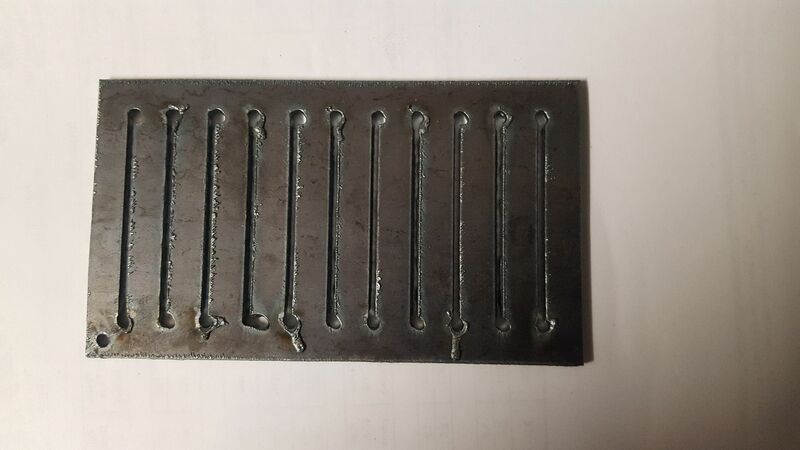 So now I have the machine dialed in for 2mm mild steel. As part of this, I told LCNC to log the torch voltage (at 1000 times a second) I kinda forgot about this for a while and the next thing I knew was I had an 8 gb text file! I also was able to do a bit of debugging of some signals and checked the code for one component I'd written becasue I was only showing a voltage of about 20 volts. This was due to a software error in my C code. I was only out by a factor of 20. I think I need to revisit the calibration resistor in the torch voltage circuit becasue I think the THCAD board is receiving a voltage above its full scale range. After fixing my error, the THCAD should have a full scale reading of 320 volts now but I think it is getting up around 400-500 volts on startup. I need to spend some more time cutting while checking some internal signals in LinuxCNC and also with a volt meter to make sure I have the torch voltage monitoring working.. I did debug a bit more of my config. Some of it I did so long ago, I had forgotten how it worked. I'd added a delay on the THC enable signal and I was able to confirm that all of my THC enabling logic (3-4 things must be true before the THC is engaged). So once I know I've got the torch voltage nailed, I will be able to look at the Torch height control. I'll be on my own as I have not seen anybody else using the new experimental LinuxCNC branch on a live machine. I really hope it works! Well progress has been a bit slow. I finally found out the problem with the torch voltage but I'm not sure I have a final solution. 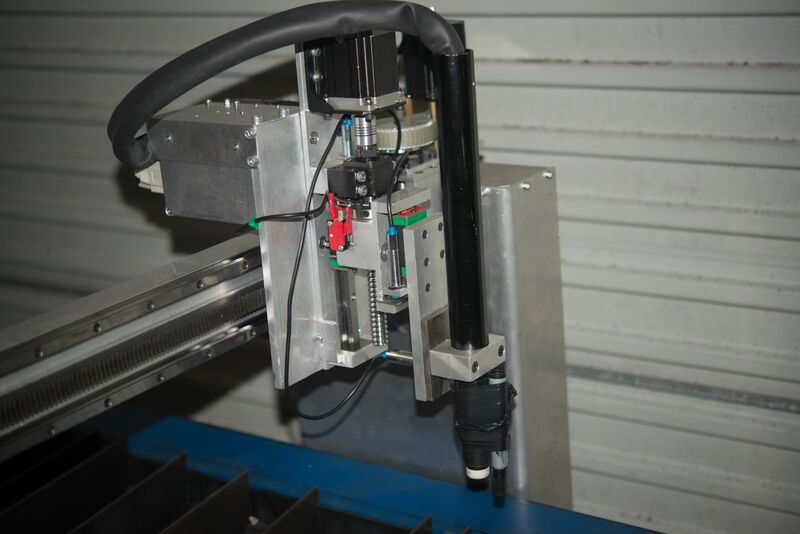 The Everlast plasma cutters shows a link on the CNC board to select 16:1 or 50:1 voltage divider. The only problem is their manual is incorrect and both link positions leave the 50:1 divider selected. You need the link in a different position. The other problem I had was that LinuxCNC and a multimeter on the raw arc voltage on the CNC port are reporting voltages that are 30% apart. This resulted in me and a mate reverse engineering the voltage divider. We worked out the resistor value on one side and this allowed us to work out the other resistor value in the divider assuming the 50:1 divider is correct. By our calculations, the divider is about 32:1, not 16:1. When I adjust for this, I think I'll end up with about 120 volts on the system when the voltmeter showed 90 volts. We figured that as there are some resistors in the raw torch voltage circuit, so it is probably understating the voltage. When I look at a few cut charts, (not just Hypertherm's), the voltage for this material is quoted as being around 120 volts. So I think I will run with that and see what happens. After all, the torch voltage is unimportant when all it is really used for is an input to the control signal for a PID control. Anyway, if anybody reading this has some ideas or suggestions, please toss in your 2 cents worth. Once I get this 100% sorted, I'll post up some details. The divider needs some noise filtering in it or you will get false voltage readings. It should also include some surge protection for your low voltage equipment. The Raw Arc Volts on the rear connector on the Everlast are not a direct connection. It would be dangerous and foolish to have un restricted raw volts on a connector (at 50A or more) that is not rated for it and expose that to a human. Running raw volts across a shop is also a bad idea . They put a 100K resistor in series with each leg (200K total ), So you start with 200K of resistance and calculate the value of resistor that you need to get the divided volts you want. Draw two resistors in series vertically . Tie the top end to Raw Volts (full voltage ) tie the bottom end to negative. Now at the junction of the two resistors you get a divided voltage . its the ratio of the two resistor values. Label the top resistor R1. Label the bottom resistor as R2. Now R1 = 100000 ohms. R2 is unknown. Write at the top 100VDC (VIN) and at the junction VOUT. It needs to be the divided volts you want if you have 100 volts in. Lets take 20:1. That makes it so VOUT = 5V. The actual accuracy depends on the tolerance of the 100K resistors so no matter what value you get on paper it will only be close. According to the THCAD manual the AD range is 0-10VDC = to get from min to max Frequency . So you have to determine what you want the top voltage to measure and scale the voltage so that 10V = max voltage to be displayed, Because you are working in frequency is not binary so picking some number like 300 makes the math a lot easier. So if 10V = 300V its 30:1 You have to design a circuit that takes the raw volts down to put it on the right range . There is no built in divider on Plasmas with that ratio. 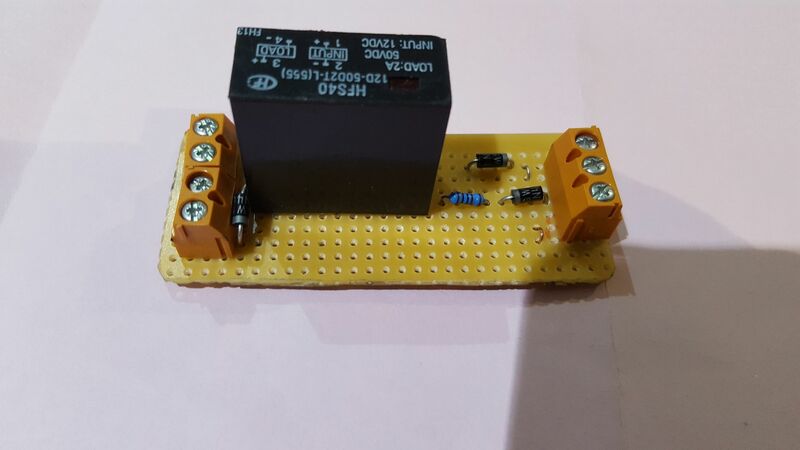 To get you close the target voltage out of the first divider is 3.333 VDC with 100VDC in.